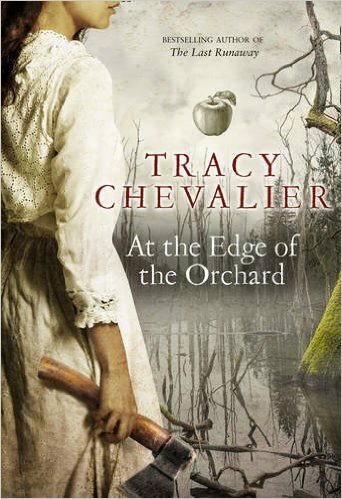 BleachHouseLibrary.ie: "At The End Of The Orchard" by Tracy Chevalier. Blog Tour with Chapter One Extract. "At The End Of The Orchard" by Tracy Chevalier. 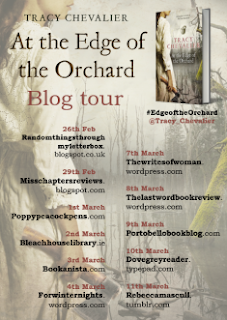 Blog Tour with Chapter One Extract. What happens when you can’t run any further? In this rich, brutal story, Tracy Chevalier is at her imaginative best, brilliantly evoking the futility of our struggle to escape our roots, no matter how hard we try. James and Sadie Goodenough have settled in the Black Swamp, planting apple trees to claim the land as their own. Life there is harsh, and as swamp fever picks off their children, husband and wife take solace in separate comforts. James patiently grows his sweet-tasting ‘eaters’ while Sadie gets drunk on applejack made fresh from ‘spitters.’ This fight over apples takes its toll on all of the Goodenoughs – a battle that will resonate over the years and all the way across America. Fifteen years later their youngest son, Robert, is drifting through Goldrush California. Haunted by the broken family he fled years earlier, memories stick to him where mud once did. When he finds steady work for a plant collector, peace seems finally to be within reach. But the past is never really past, and one day Robert is forced to confront the reasons he left behind everything he loved. Tracy Chevalier is the author of seven previous novels, including the international bestseller Girl with a Pearl Earring. Renowned for her rich evocations of periods past, Girl With a Pearl Earring was Tracy’s second novel and in 2004 was made into a film starring Colin Firth and Scarlett Johansson. To date it has sold 5 million copies globally. Her other titles include: The Last Runaway, Remarkable Creatures, Burning Bright, The Lady and the Unicorn, Falling Angels and The Virgin Blue. In April, Reader, I Married Him is published, an anthology Tracy has edited in celebration of Charlotte Brontë’s bicentenary. The collection contains short stories by over 21 of the finest women writing today. Contributors include Lionel Shriver, Sarah Hall, Helen Dunmore, Salley Vickers and Tessa Hadley, who all use Jane Eyre’s famous words as a springboard for their own flights of imagination in a wide variety of tones and approaches. To read more about Tracy and her titles, visit her website www.tchevalier.com. They were fighting over apples again. He wanted to grow more eaters, to eat; she wanted spitters, to drink. It was an argument rehearsed so often that by now they both played their parts perfectly, their words flowing smooth and monotonous around each other since they had heard them enough times not to have to listen anymore. What made the fight between sweet and sour different this time was not that James Goodenough was tired; he was always tired. It wore a man down, carving out a life from the Black Swamp. It was not that Sadie Goodenough was hung over; she was often hung over. The difference was that John Chapman had been with them the night before. Of all the Goodenoughs, only Sadie stayed up and listened to him talk late into the night, occasionally throwing pinecones onto the fi re to make it flare. The spark in his eyes and belly and God knows where else had leapt over to her like a flame finding its true path from one curled wood shaving to another. She was always happier, sassier and surer of herself after John Chapman visited. Tired as he was, James could not sleep while John Chapman’s voice drilled through the cabin with the persistence of a swamp mosquito. He might have managed if he had joined his children up in the attic, but he did not want to leave the bed across the room from the hearth like an open invitation. After twenty years together, he no longer lusted after Sadie as he once had, particularly since applejack had brought out her vicious side. But when John Chapman came to see the Goodenoughs, James found himself noting the heft of her breasts beneath her threadbare blue dress, and the surprise of her waist, thicker but still intact after ten children. He did not know if John Chapman noticed such things as well—for a man in his sixties, he was still lean and vigorous, despite the iron gray in his unkempt hair. James did not want to find out. John Chapman was an apple man who paddled up and down Ohio rivers in a double canoe full of apple trees, selling them to settlers. He first appeared when the Goodenoughs were new arrivals in the Black Swamp, bringing his boatload of trees and mildly reminding them that they were expected to grow fifty fruit trees on their claim within three years if they wanted to hold on to it legally. In the law’s eyes an orchard was a clear sign of a settler’s intention to remain. James bought twenty trees on the spot. He did not want to point a finger at John Chapman for their subsequent misfortunes, but occasionally he was reminded of this initial sale and grimaced. On offer were one-year-old seedlings or three-year-old saplings, which were three times the price of seedlings but would produce fruit two years sooner. If he had been sensible—and he was sensible!—James would simply have bought fifty cheaper seedlings, cleared a nursery space for them and left them to grow while he methodically cleared land for an orchard whenever he had the time. But it would also have meant going five years without the taste of apples. James Goodenough did not think he could bear that loss for so long—not in the misery of the Black Swamp, with its stagnant water, its stench of rot and mold, its thick black mud that even scrubbing couldn’t get out of skin and cloth. He needed a taste to sweeten the blow of ending up here. Planting saplings meant they would have apples two years sooner. And so he bought twenty saplings he could not really afford, and took the time he did not really have to clear a patch of land for them. That put him behind on planting crops, so that their first harvest was poor, and they got into a debt he was still paying off, nine years on. “They’re my trees,” Sadie insisted now, laying claim to a row of ten spitters James was planning to graft into eaters. “John Chapman gave ’em to me four years ago. You can ask him when he comes back—he’ll remember. Don’t you dare touch ’em.” She took a knife to a side of ham to cut slices for supper. “We bought those seedlings from him. He didn’t give them to you. Chapman never gives away trees, only seeds—seedlings and saplings are worth too much for him to give away. Anyway, you’re wrong—those trees are too big to be from seeds planted four years ago. And they’re not yours—they’re the farm’s.” As he spoke James could see his wife blocking out his words, but he couldn’t help piling sentence upon sentence to try to get her to listen. It needled him that Sadie would try to lay claim to trees in the orchard when she couldn’t even tell you their history. It was really not that difficult to recall the details of thirty-eight trees. Point at any one of them and James could tell you what year it was planted, from seed or seedling or sapling, or grafted. He could tell you where it came from—a graft from the Goodenough farm back in Connecticut, or a handful of seeds from a Toledo farmer’s Roxbury Russet, or another sapling bought from John Chapman when a bear fur brought in a little money. He could tell you the yield of each tree each year, which week in May each blossomed, when the apples would be ready for picking and whether they should be cooked, dried, pressed or eaten just as they were. He knew which trees had suffered from scab, which from mildew, which from red spider mite and what you did to get rid of each. It was knowledge so basic to James Goodenough that he couldn’t imagine it would not be to others, and so he was constantly astonished at his family’s ignorance concerning their apples. They seemed to think you scattered some seeds and picked the results, with no steps in between. Except for Robert. The youngest Goodenough child was always the exception. At The End Of The Orchard is published by Borough Press on 10th March and is available in Hardback and ebook format.